Naming them was such a challenge for a couple reasons…the biggest of which is probably that my husband and I have very different name styles that we like – something we already knew after having to name Logan five years ago and having a hard enough time just doing the one. Dan likes more traditional (read: boring) names while I prefer more modern (in his opinion, weird) name choices. So he was throwing out names like Jennifer, Kelly, Amber, etc. while I was going for choices like Aubrey, Piper, Zoe, and so on. I told him that if we knew 20 people our own age with the name that he could assume I wasn’t going to go for it lol. Then on top of it, the names have to sound nice together, be able to stand up individually, and also go with both our last names and Logan’s name. It was a hot mess, honestly, and we had weeks on end where we just didn’t talk about names at all to avoid the frustration. But eventually, we settled on them and then quickly got them onto Facebook before one of the 30 other pregnant moms we know could “take” one of them and we’d have to start the process all over again. SO…I’m very, very proud to lay claim to my girls’ names: Arielle Piper (Baby A) and Daniela Rylee (Baby B). Dani and Ari for short…and we’re hoping the spelling of Arielle will help people pronounce it the way we want them to (Ahh-ree-ell as opposed to air-ee-uhl like from The Little Mermaid). They’re both beautiful full names, have cute nicknames, go well together and individually, and sound great alongside Logan and with our last names too. Cute on tiny babies and names they can put on job applications as adults without grimacing. Total package. And now that we’ve made it “Facebook official” I couldn’t care less if someone else steals one because they’re unique enough that we’ll all know they just took our idea. Perfect. Fun facts: Coincedentally, both girls’ names have the same number of letters in them…I’m a total numbers nerd so when I realized this I was stoked (yup, go ahead, go back and count them, I know you want to…). And Daniela, who is obviously named after her father, has the same initials as him too, DRD (“Dr. D” my husband calls it). Her middle name is also spelled the way it is because originally I’d wanted to give the middle name Lee to one of the girls – it’s both my and my dad’s middle name – but once we picked the first names, I found I didn’t like it with either one (and we sure as hell weren’t going back to the first name conversation) so after Dan suggested Rylee and we agreed on that, I realized I could still sneak Lee in there if we spelled it Rylee instead of Riley. Boom. 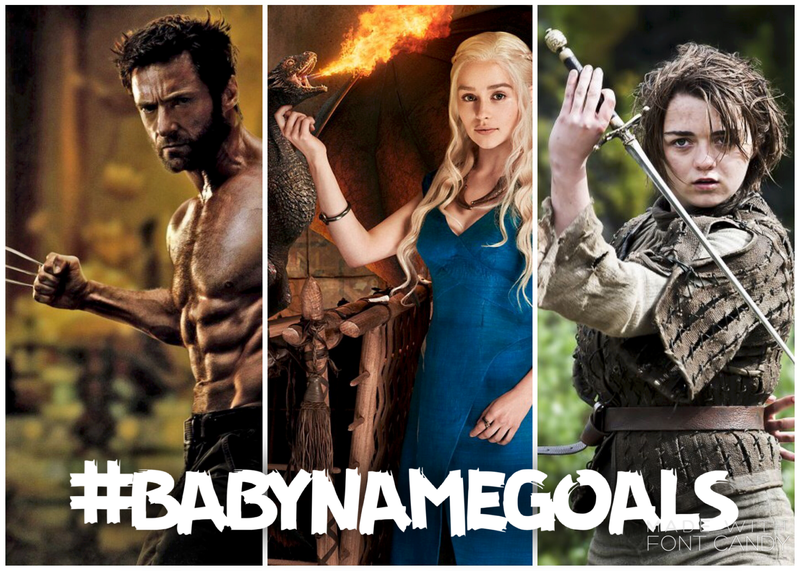 So why all the fuss about naming them so soon in the first place? Aside from my classic Type A need to have everything planned in advance, I also had a very real fear that if we couldn’t pick them in the time we had before they were born, they might never have names at all. Or we’d settle on something mediocre just to get it over with. I feel like it also helps us bond with them a little more before they’re even here…it’s a little more personal and “real” when I can refer to either of them by name. But the biggest reason, the thing that was really starting to get to me, was that whenever the subject came up and we said that we didn’t have names picked out, people felt the need to start throwing out suggestions at us. Drove me crazy. About half of the time it was “name them after me!” and the other half it was awful names or pairs of names that I hated and then had to try and nicely deflect without hurting their feelings. Every freaking time…both annoying as all hell. And on the rare occasion that someone suggested one that wasn’t terrible, I immediately got turned off even if I did previously like it, because later on I didn’t want anyone else to be able to say that they had named one of my kids. Previous postTo Work or Not To Work? ?